It’s hard to believe how delicious this stupid simple recipe for a Keto nut and seed bread turns out. 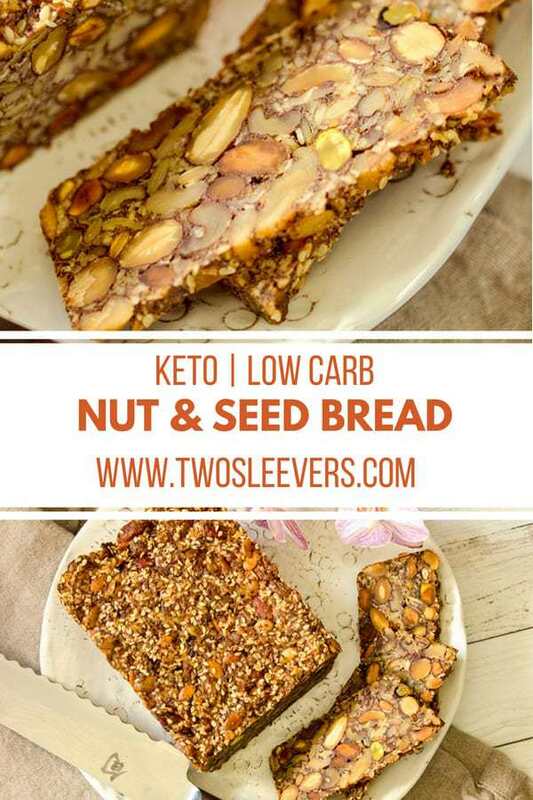 Mix a variety of nuts and seeds together with a little egg and oil, bake, and soon you’ll be eating delicious slices of keto bread. It’s vegetarian, gluten-free, yeast free, and very filling and hearty. I’ve seen recipes all over for what people are calling a Nordic stone age bread. Interestingly I haven’t seen that many explanations of why this called Nordic, nor stone age, and if you haven’t eaten it, you’ll be wondering why it’s even called bread really. No flour or yeast, or leavening agent, just a mix of nuts and seeds, and it’s somehow magically bread? Actually. Yeah. Yeah, it is. Or bread-ish. Like, VERY GOOD bread-ish. I was terribly skeptical. Moreover, the other recipes called for 6 cups of nuts and seeds which sounded horridly expensive. I’m cheap. We also don’t eat that much. 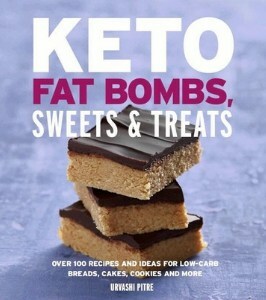 While I’m all about finding keto bread that tastes delicious (and let’s be honest many of them do not taste delicious), I was not about to risk that many nuts over something I wasn’t sure would work to make a huge hunk of something we might have hated. So I decided to tweak a little, make a smaller batch, and see what the fuss was all about. Well, I tell you what. It’s worth every penny for those nuts and seeds. Besides–I have a confession to make. I used a bunch of different nuts and seeds in open bags that really needed using up soon so it’s not like I ran out to buy half cups of a variety of nuts. 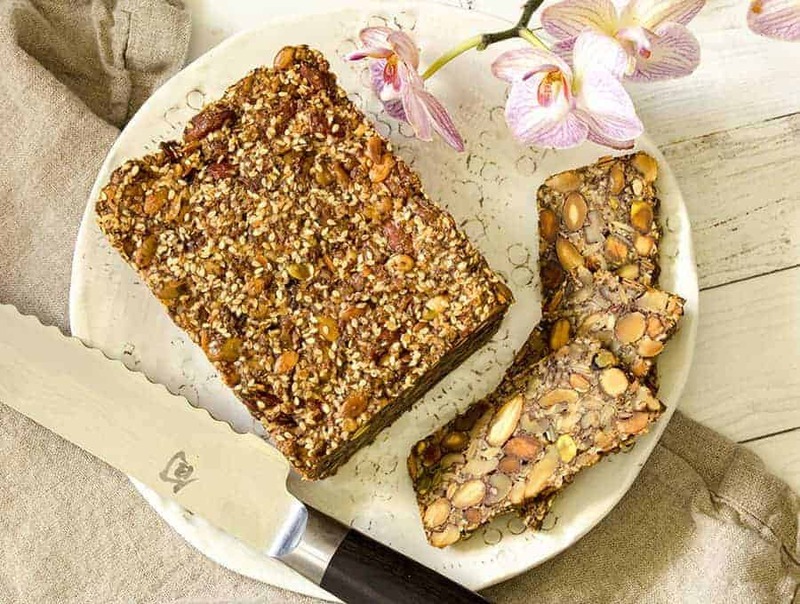 Which is the other nice thing about this Nut and Seed Bread recipe. It’s a use-it-up recipe that seems flexible. 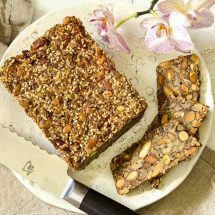 I think you definitely need a good combo of whole nuts and small seeds, and you definitely need ground or whole flax seeds. I don’t read Danish very well (or at all, for that matter) so while I can tell you this is called Stenalderbrød, which means stone age bread. I suspect it’s more stone age = Paleo or Low Carb. Not that cavemen were actually using 3 cups of nuts and 3 eggs and baking bread out of it. Because if they were, historians and archeologists totally need to up their game to find us more delicious recipes from that time period. I think this recipe was created by Thomas Rode but I’m sure I’ve messed with it enough to where he probably doesn’t want me calling it his recipe entirely! Let’s just say all the credit is his and the mistakes are mine. That is probably very accurate. 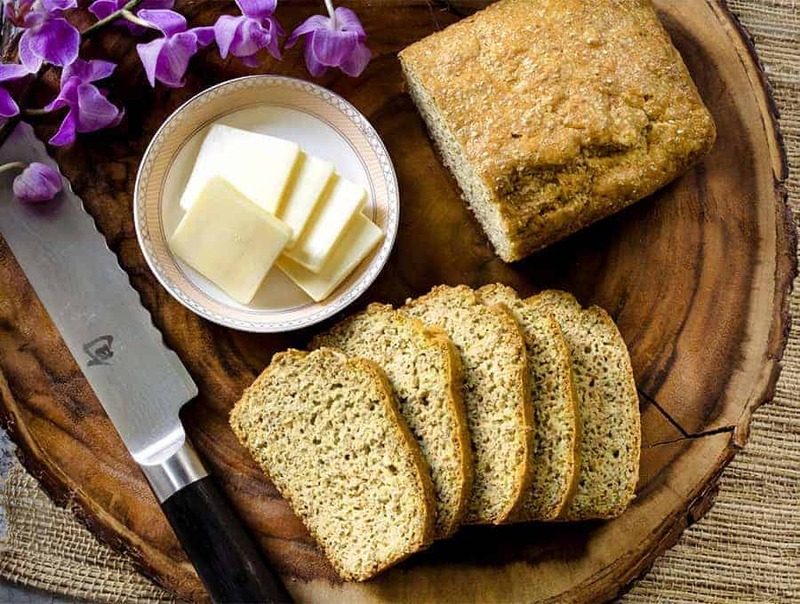 Looking for more great low carb bread options? Check out my Keto Bread recipe! This bread is unbelievable and is not eggy tasting at all! 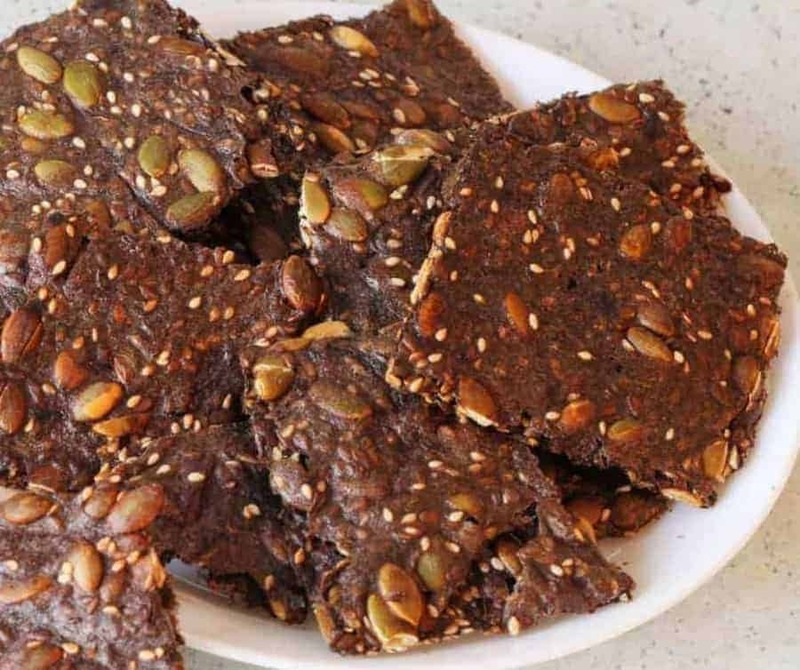 Another great recipe to check out is my Keto Low Carb Crackers with Seeds recipe. They make a great cracker alternative if you’re on a gluten free diet! Use a combination of whole nuts and smaller seeds. Use whatever you have lying around, it will work as long as you follow the rest of the directions. Do not cut the whole nuts. I wasn’t sure how those would work but they sliced beautifully in the finished product. Do not omit the flax seed, and if possible use ground flax seeds. These, along with the egg, serve as a binder for the bread. Cook for the specified length of time. You won’t be able to do a chopstick test on it while it’s hot. There’s not a lot that truly needs cooking forever, but I haven’t had time to experiment with shorter cook times. I can tell you it works beautifully at 45 minutes. Be sure to grease the pan well so the beautiful seed bread pops right out. Serve with lots of butter. It's hard to believe how delicious this stupid simple recipe for a Keto Nut and Seed Bread turns out! It's gluten free, low carb and SO GOOD! Yet another crazy complicated recipe! In a large bowl, mix everything together. Bake at 325F for 45 mins and then let the pan cool for 10 minutes. Turn out the bread and let it finish cooling. You can use whatever combination of nuts and seeds you'd like. The only things you really need are the flax seeds or ground flax to hold it together. Having a mix of big nuts and small seeds helps provide good texture to the bread. Delicious! And super simple to prepare. Looks gorgeous. Many of the nuts in your photo seem to be quite golden in color. Did you toast any of them? It’s a combination of things I think. Some were roasted like the whole nuts. But the others like the sesame seeds for toasted during the baking I think. I’m making this now! What size loaf pan did you use? My mini seems too small. My medium was way too big- would have been 2″ tall. I pushed it to one end to make it more bread -shaped. Well see! i want to make this, should the nuts roasted or raw, salted or unsalted?? thanks looks yummy. I don’t think it really matters, to be honest. I’d use whatever tastes good to you. If you use salted ones skip adding any salt and I think you should be all set!